From the I'm thinking about buying a Scion department... I guess all this advertising is working, cuz I'm seriously thinking about getting a Scion, WTF?!? 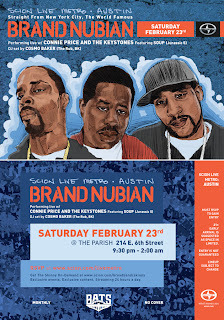 Brand Nubian @ The Parish on Feb 23rd... performing with Connie Price and The Keystones featuring Soup, a founding member of Jurassic 5 and DJ Cosmo Baker. You know the drill... RSVP here. Brand Nubian is a hip hop group from New Rochelle, New York, consisting of three MCs: Grand Puba (born Maxwell Dixon, March 4, 1966), Sadat X (formerly Derek X, born Derek Murphy) and Lord Jamar (born Lorenzo Dechalus, on September 17, 1968, in New Rochelle, New York), and two DJs, DJ Alamo and DJ Sincere. It is one of the more popular and acclaimed alternative hip hop groups of the 1990s, known for socially conscious and politically charged content inspired by the teachings of the Nation of Gods and Earths. Brand Nubian formed in 1989 after Grand Puba's original group, Masters of Ceremony, split up. Its first single, "Brand Nubian," was released in 1989. Signed to Elektra Records by A&R man Dante Ross, its debut album, One For All, was released in 1990. Generally acclaimed, the album drew fire for militant Five-Percenter rhetoric on tracks such as "Drop the Bomb" and "Wake Up." The controversy helped sales, though the album was still not a great commercial success. To date, the album has sold 350,000 units. A version of the Fab Five Freddy-directed video for the single "Wake Up," featuring a Black man in white-face makeup, was also banned from MTV. On MTV and from official WEA sources, this image was replaced by a Baptist preacher. The singles "Slow Down," "All for One," and "Wake Up" all became hits on Billboard’s Hot Rap Tracks chart in 1991. Shortly after its debut release, Sadat X and Lord Jamar began having problems with Grand Puba, which caused him to leave the group, along with DJ Alamo, to pursue a solo career. Lord Jamar and Sadat X enlisted DJ Sincere to join the group in 1992. The same year, Puba released his solo debut, Reel to Reel, which featured the hit single "360 Degrees (What Goes Around)".